Israeli forces uproot and steal olive trees in Sur Baher, April 23, 2018. Photo credit: Israel Land Authority. Israeli authorities plan to build a new settlement in Sur Baher for Israeli police and military. 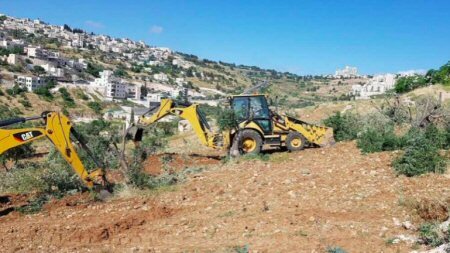 Using bulldozers, cranes and armed police, Israeli authorities uprooted at least 60 olive trees in the East Jerusalem neighborhood of Sur Baher on April 23, 2018. Signs reading, “no trespassing” were left in their place. According to settlement watch group Peace Now, Israeli authorities announced plans in 2012 to build a settlement consisting of 180 units in Sur Baher for members of the Israeli military and police. Israeli authorities had originally expropriated the land in 1970, but for “public use” – a designation that typically sets the stage for building Israeli national parks on stolen Palestinian land, rather than residential settlements. The area affected by Israeli settlement plan No. 7977 in Sur Baher. Photo credit: Peace Now. Ahmad Nimr, one of the affected landowners, told the Palestinian Information Center that the land and trees belong to the Nimr, Dweiyat, Awad and Amira families. He adds that many of the 500 olive trees on the land are over 100 years old. Until Monday, Israeli authorities had largely ignored the olive grove and the four families continued to cultivate it. The Israeli Supreme Court ruled against their objections to the settlement plan in 2014. Haaretz reports that the stolen trees will be replanted in an Israeli national park in Jerusalem. The Jerusalem municipality is well known for classifying Palestinian areas as so-called national parks to wrest control over more territory. The parks, like Israeli settlements, stand in violation of UN Security Council resolutions 194, 181, 252, 476 and 478. The aftermath of the olive tree uprooting in Sur Baher, April 23, 2018. Photo credit: Peace Now.